In the widely used staked design ball joint, the tube is swaged around the ball for a metal-to-metal ball joint that doesn’t allow excessive play. The quick-disconnect ball joint is ideal for applications requiring rapid assembly and disassembly of the ball joint. Lakeville, MN [January 1, 2015] – QA1 Precision Products, Inc., is excited to release staked design ball joints and quick-disconnect style ball joints for the industrial market. 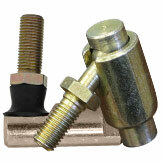 The quick-disconnect ball joint is ideal for applications requiring rapid assembly and disassembly of the ball joint. With a stainless steel spring, the quick-disconnect feature also results in ease of maintenance. Right and left hand threads are available for use in a multitude of OEM and aftermarket applications, including agricultural and lawn and garden equipment and other industrial applications. Both ball joints are manufactured from carbon steel and are protective coated for corrosion resistance. Ideal for both OEM and MRO applications, these products are stocked at QA1’s Lakeville, Minnesota facility, and will be available in late January 2015.